The OACD Healthy Soils Project is a voluntary effort to conserve the natural resources of Oklahoma by encouraging agriculture producers to participate in proven conservation practices. Healthy soil is key to positively impacting all areas of our environment. By implementing soil conservation practices, we can improve water quality, increase the amount of water available for drinking and recreation, sequester carbon, provide cleaner air and improve the habitat for native wildlife and pollinators. Improving soil health increases organic matter in the soil, fosters the microbial life and provides nutrients for crops. Oklahoma is the second most ecologically diverse state in the United States with 11 different ecoregions. Because of a strong local conservation partnership and natural resource expertise, Oklahoma is a premier pilot site to test soil health projects for the Southern Plains and the United States. Though the Healthy Soils Project, OACD launched the first four demonstration farms in 2016, and will establish the final demonstration farm in Area V in 2019. The farms range in size from 45 acres to 120 acres. Demonstration farm locations are selected through a competitive, transparent application process. Farmers will be provided with a conservation mentor, seed for planting cover crops, technical advice from agronomists and testing and monitoring equipment. Since the days of the Dust Bowl in the 1930s, Oklahoma conservationists have been working at the local level to educate their neighbors about methods to preserve the land. By establishing demonstration farms on local, privately-held lands through a voluntary system, agriculture producers will be able to see firsthand the environmental and economic benefit of engaging in soil health conservation. The 2019 application cycle is open to individuals who are interested in planting a warm season cover crop and reside in Area V in the Oklahoma Association of Conservation District’s area map. All applications must be postmarked or emailed on or before January 30, 2019 to be eligible for consideration. Selections for the warm season cover crop cooperators will be made at in February 2019. Each demonstration farm will host a field day for their neighbors, community members, locally-elected officials and industry partners to observe the results of implementing cover crops and soil health practices. During these field days, experts from Oklahoma State University, the Oklahoma Conservation Commission and the Natural Resources Conservation Service will be available to answer questions and provide more information. Additional private financial resources are needed to provide logistical, technical, educational and outreach support for the project. For more information or to support the Healthy Soils Project, contact Sarah Blaney at sarahblaney@okconservation.org. Research newly released by NACD and Datu Research finds using cover crops and/or no-till can result in an economic return of over $100 per acre. 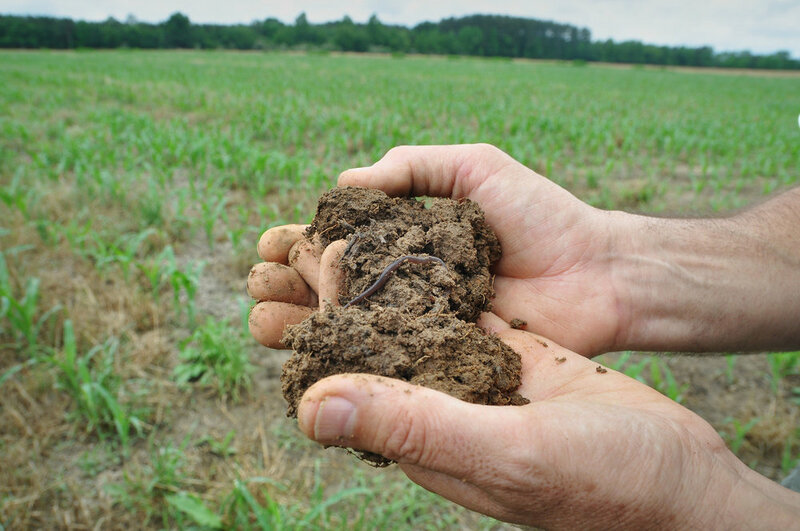 Landowners and farmers across the nation increasingly realize that healthy soils are the key to fostering more productive, profitable and sustainable farms—for healthy, sustainable, long-term returns. This Soil Health Information Starter Kit will provide you with the basics and benefits of soil health, and ideas on how you can work with your farmer to build soil equity by using soil health management systems that include cover crops, diverse rotations and no-till practices. The mobile rainfall simulator helps demonstrate the benefits of no-till conservation practices for healthy soils. Request your demonstration by contacting Sarah Blaney at sarahblaney@okconservation.org.